About this time of year after Easter, we traditionally read the story from the gospel of John about Thomas. We like to call him Doubting Thomas. And most often pastors set up Thomas as a man whose doubt made him a persons of weak faith. These pastors say that we need to heed Jesus words and believe even though we do not see because doing so makes us blessed. The essential message is that doubt implies lack of faith. So do not doubt. Instead trust and believe what you may not see. Well, I don’t agree. In fact, I’ll be honest in saying that I have doubts of my own from time to time. And maybe that is something you have never heard a pastor say before. But you see, I have found in my own life that doubt has been a gift that has led me to greater faith. All the disciples get to see Jesus after the resurrection, except Thomas. And Thomas is really only asking to have the experience the other disciples had. Yeah, he kinda throws out an ultimatum, but isn’t that ultimatum about wanting to have the same experience of seeing Jesus that the other disciples had? And I think that is a pretty natural, pretty human response. I imagine I would be quite jealous and want to have that experience too. What we do know is that Thomas is experiencing doubt. We know this because he is honest about it within his faith community, and even lifts his doubt up and pushes it forward. And this is significant. Pay attention to the story: What leads to Thomas encounter with Jesus? until after he invites Thomas to touch his wounds. Jesus words are not a commandment against doubting, as if doubt is the opposite of faith. No, Jesus comes to Thomas because of his doubt, invites him to an experience with him, and then encourages him to believe! So I strongly believe that doubts are part of the journey of faith, not an obstacle to faith. Doubt is a gift. It is part of the receiving of faith. 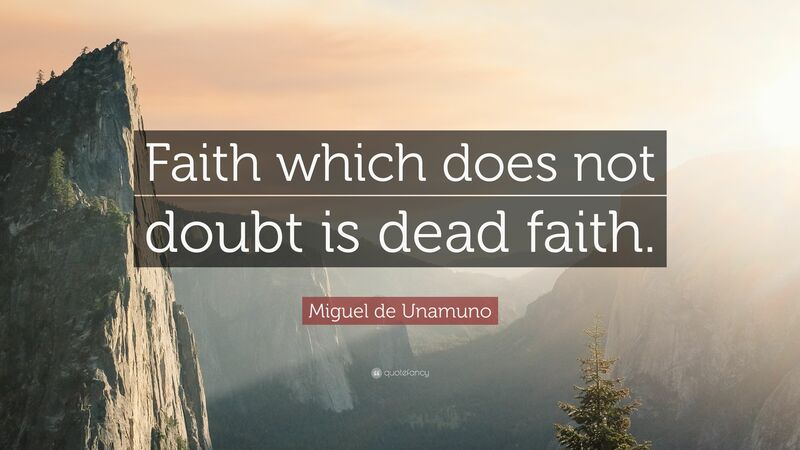 Doubt is what deepens faith. Doubt gives faith legs as it pushes us to the limits of our understanding and guides us into a relationship that is deeper than mere belief.